(Photo: Reuters / Jaime Saldarriaga)Chile's President Sebastian Pinera gives a speech during the opening ceremony of the VII Pacific Allianz Summit in Cali May 23, 2013. 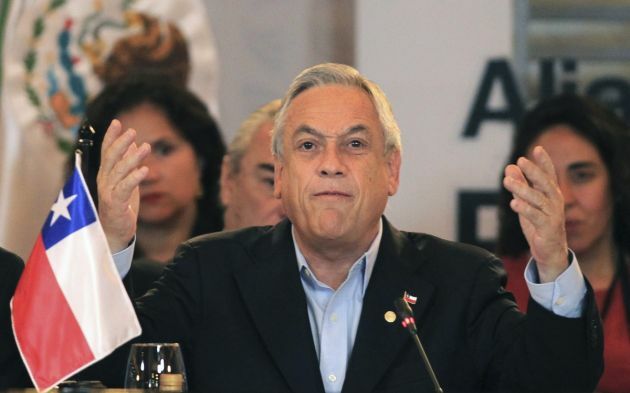 Chilean president Sebastian Pinera announced in late May a new initiative to boost the nations' sluggish birth rate: the country will pay women to have more children. Women, regardless of economic or marital status will be paid $200 for their third child, $300 for their fourth and $400 for their fifth. Pinera, like 70 percent of Chile, is Roman Catholic, and the plan has already been dubbed "Bono Opus Dei," or God's good work. The Economist magazine on June 1 called it a "Child bribe." And, indeed, the measure is in keeping with Catholic teachings on family, which holds that "responsible parenthood is a fundamental requirement of a married couple's true mission." But there is also a pragmatic, economic incentive: More babies mean more national wealth. Chile and Brazil are tied for having the lowest birth rate in South America. On average, women in these countries are having 1.8 children. Comparatively, in Niger, which has the world's highest birth rate, women are having, on average, seven children. Low national birth rates are problematic because small populations are less productive and thus generate less wealth. On the flip side, however, too many babies can put a strain on resources as they did in post-revolutionary China. Mao Zedong had actually encouraged large families and made abortion illegal in order to facilitate a larger Chinese workforce. But after 30 years of compliance, the Chinese population was almost 1 billion strong, and the Chinese government enacted the infamous one-child policy. In a presidential address last month, Pinera focused on economic development, emphasizing the need for job creation and continued growth. While Chile's economy is doing well, it has been hard hit by the decreasing value of copper. Copper mining of makes up 20 percent of the nation's gross domestic product and 60 percent of its exports. But in the first few months of 2013, the price of copper dropped 15 percent. Furthermore, according to an April report by The Economist, Chile's copper mines are old, meaning pits must be dug deeper and deeper. This costs both time and money, and it makes younger mines more attractive. Pinera's child incentive proposal must first be approved by the Chilean congress, and if it passes, will go into effect on Jan. 1, 2014. Catalina Siles, a researcher at the Institute for Societal Studies, told Catholic News Agency the proposal brings to the forefront an issue absent in the public debate and in government priorities. "The credit is not intended to solve the underlying problem and much less oblige families to have children, but instead it is a step, a positive measure," she said, labeling criticism of the bill as "a bit unfair."